Unfortunately, most wedding guest books get stored in a box somewhere, never to be seen again. And who can blame you, really? Do you really want to display a book filled with boring signatures? Take a look at these ideas for creative, crafty, guest books you’ll actually want to hold onto. Love to travel? Why not have guests sign locations on a vintage atlas? They can recommend places they’ve been, or send you to destinations they wish they’ve gone themselves. Are you wine connoisseurs? Have wine bottle labels printed with milestone anniversary dates, or upcoming special occasions (purchase your forever home, first baby is born). Then have your guests sign the labels. You’ll have them on display for years to come. Love to DIY? Take a traditional guest book and craft it! Set your guest book on a table with a polaroid camera, washi tape, and colorful marker pens. Let your guests snap a candid and write a little note. Love Scrabble or reading? Why not use an old dictionary? Let your guests sign on a word that means something to them, or a word they think describes the two of you. Use felt-tip pens for this so the messages don’t destroy the pages. Shadowbox Wall Hanging. Pick up a shadowbox and some tiny wooden hearts at a craft store. 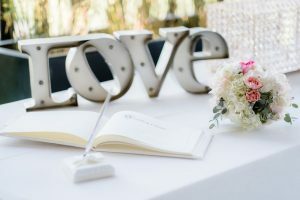 Have guests write their names on the hearts and drop them into the box. You’ll have a new decoration for your first married home. Not a fan of Scrabble? How about other board games? Have your guests sign Jenga blocks, or a monopoly board, or anything else you love to play. You’ll get to relive your big day whenever you play. What about MadLibs? Create a MadLibs style questionnaire for guests to complete. You’ll have a good laugh reading them back! Are you a writer? Get a vintage typewriter and let guests type up a few lines for you. Bind the pages when you’re done and you have a unique new addition to your bookcase. Whatever you choose, make it YOURS. Your guest book doesn’t have to be something you forget about. Create something you’ll want to flip through for years to come.